One of these companies is stumbling in a big way. Under Armour, Inc. (NYSE:UA)(NYSE:UAA) and Adidas (NASDAQOTH:ADDYY) are two of the best-known brands in the athletic world. Adidas has been around for decades, most notably dominating global soccer, while Under Armour is the hot upstart from Baltimore. But over the last three years, the companies have been going in opposite directions. Adidas stock is up 217% in U.S. trading, while Under Armour is down 59%. Will the trend continue, or is Under Armour an undervalued sporting goods play today? The chart below shows why Adidas' stock has performed better than Under Armour's. 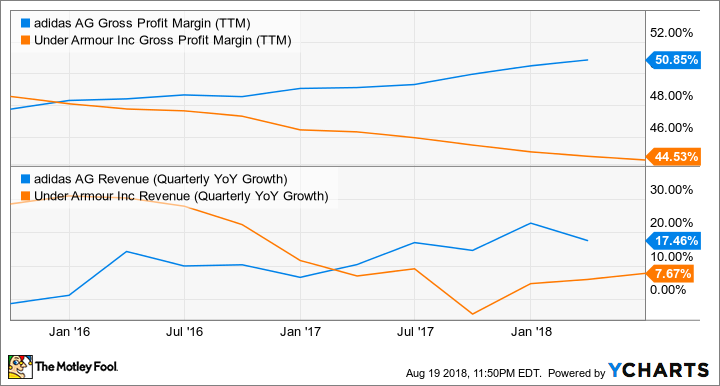 Over the past three years, Adidas revenue growth and margins have been improving, while Under Armour's growth has decelerated and margins are on the decline. What I think Adidas has gotten right over this period is leveraging its strength in soccer to enter other markets. Soccer's improving popularity in the U.S. doesn't hurt, helping the company gain awareness and drive double-digit growth in adjacent training, running, and football categories. These haven't traditionally been core markets for Adidas, but they're becoming important as the company expands its product reach. And they're helping drive revenue and margin growth. Brands are difficult to maintain long-term, especially as competitors see where others have succeeded and attack those strengths. Under Armour is facing a lot of challenges; other sporting goods companies see the success it has had with performance wear and have begun to introduce their own products. Nike, in particular, has attacked every major product category Under Armour has, and has in many ways made more attractive products. Under Armour has also had challenges translating its sponsorship of Stephen Curry to basketball shoe sales. Curry-branded shoes were dogged by poor reviews and weak sales in their first few iterations, and have never become the popular product you might think they would be given the Golden State Warriors star's popularity. After giving Curry a new contract in 2015, including an equity stake in the company, Under Armour hasn't had much success delivering on the promise of its most valuable celebrity endorsement. What I think we're really seeing is a branding problem. The company's aggressive, bright designs haven't been as popular as more subdued and subtle styles introduced by Nike and Adidas, and Under Armour's product missteps haven't engendered much consumer loyalty. Adidas seems to be a more common brand around town, while Under Armour seems like it's seen less and less -- and that's not good for any brand. Given its solid foundation in soccer, ability to grow into new markets, and superior financials, I think Adidas is a better stock today than Under Armour. It's expensive, with a price/earnings ratio of 30x, but Under Armour has lost $159 million in the past year, and has a lot of work ahead improving margins and profitability in a competitive sporting goods market.